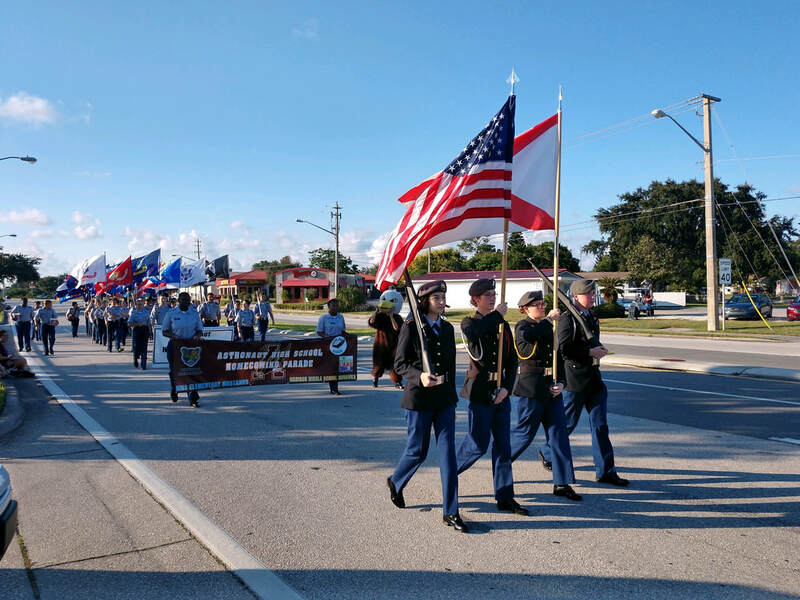 ​On February 2nd, 2019, Cadets in the War Eagle Battalion Color Guard went to the Cape Canaveral Cemetery at 8:45 in the morning and began to honor the returning unclaimed veterans. 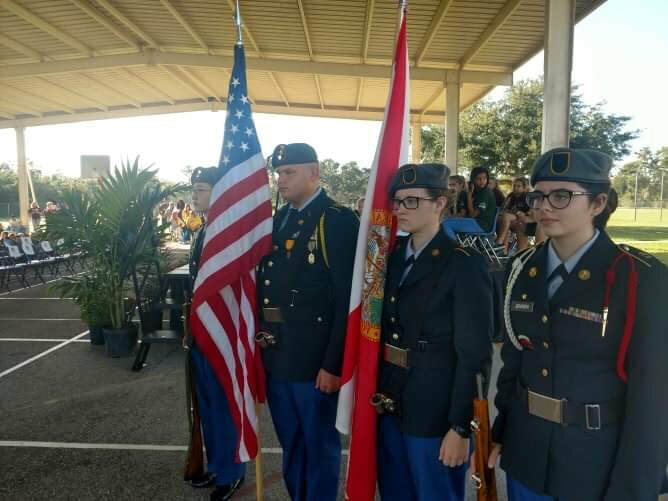 Cadets stood by family members holding the Nations flag and saluted family members of the fallen veterans to honor their life and to pay respects. ​On January 21st, 2019, Cadets in the War Eagle Battalion met up off of South Street 10am and began marching at 11am. Led by the Color Guard, cadets marched while others passed out candy. C/PVT Nembhard helped guide C/PFC Conley while he wore the War Eagle costume. ​On December 10th, 2018, Cadets in JROTC began their week with “Cadet Challenge”. Cadets ran 1 mile on Monday, did push-ups on Tuesday, sit ups and pull ups on Wednesday, and the sit and reach plus shuttle run on Thursday, then make-ups on Friday. ​On December 3rd, 2018, Cadets in the War Eagle Battalion began “Shooting week” where cadets from each company got the opportunity to learn how to properly handle a rifle and shoot. 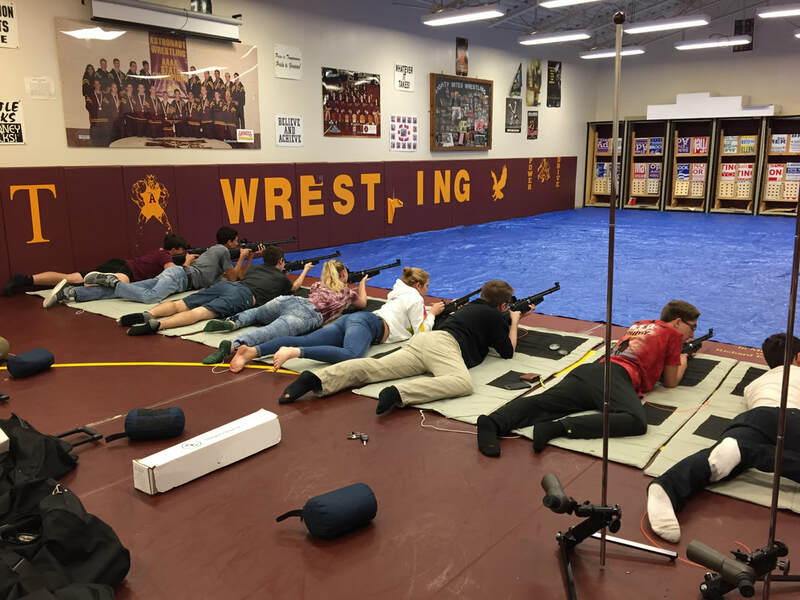 Cadets shot at targets in the wrestling room and some tried out for the JROTC Rifle team in the process. On November 30th, 2018, The War Eagle Battalion cadets went to the Indian Country Club Preserve to attend Military Ball. When the event started, cadets went either alone or with a date under a Saber Arch to take a photo then went into a receiving line to greet people such as: LTC Whalen, Mrs. Whalen, Mrs. Negron, Mrs. Miller, etc. After cadets were seated by companies, the formal part of the event began with C/Major Howell introducing C/CPL Schumacher to sing the National Anthem. Afterwards, the Color Guard honored the colors and had special guest speaker 2LTBernenda Marc speak about how she enlisted into the National Guard and what she does now. The cadet’s payed tribute to the fallen soldiers while C/CPT McKeon set a table dedicated to them. Cadets gave a toast to all branches of the military, POWs/MIAs, the guest of honor, and to the ladies. Then, the youngest and oldest cadet in the program used a saber to cut the cake to represent the new coming people and older people leaving. When the formal event ended, cadets lined up to eat dinner then enjoyed the rest of their night with dancing. ​On January 29th, 2019, Cadets LTC DeVane, Major Lugo, CSM Mabry, CPT Harman, and 1LT Pridgen represented the JROTC War Eagle Battalion for Expo night. Cadets came to school at 5pm for a parent meeting then stayed till the end of the Expo. The Color Guard carried colors and honored the State flag during the national anthem. Afterwards, Cadets 1LT Pridgen, CSM Mabry, and LTC DeVane walked across the stage while holding the State flag to represent the program. When the meeting was over, students who went to the JROTC table got to see achievements from the program such as trophies from Raiders and Drill. Students who signed up for the program got briefed on what the program has to offer and what teams they can join. 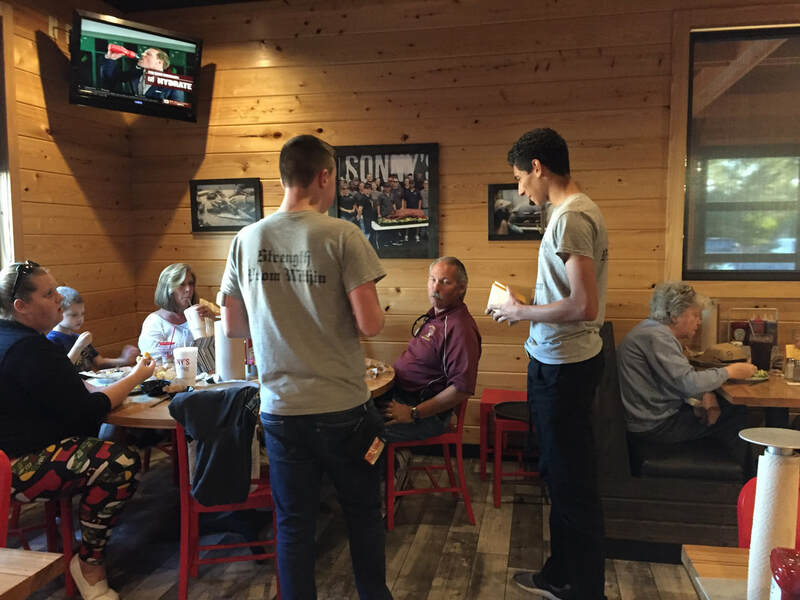 ​On December 6th, 2018, Cadets in the War Eagle Battalion volunteered to go to Sonny’s BBQ to help fund the JROTC program. Cadets greeted people and left cards on tables that informed customers about leaving their receipts in a bucket by the cash register and that 10% of their total amount would be donated to the program. Cadets worked in two shifts from 4:00-6:30pm and 6:30-8:00pm. ​On December 1st, 2018, Cadets in the War Eagle Battalion led the Mims Christmas parade. With the Color Guard leading the way, cadets marched and walked down US 1 ending at AJ’s gas station. Cadets came to Mims Elementary school at 9am to prepare for the parade then got into formation at 10am and stepped off at 10:30am. C/2LT Britt helped guide C/PFC Gibson who was wearing the War Eagle costume, down the street and greeted families along with other cadets passing out candy. 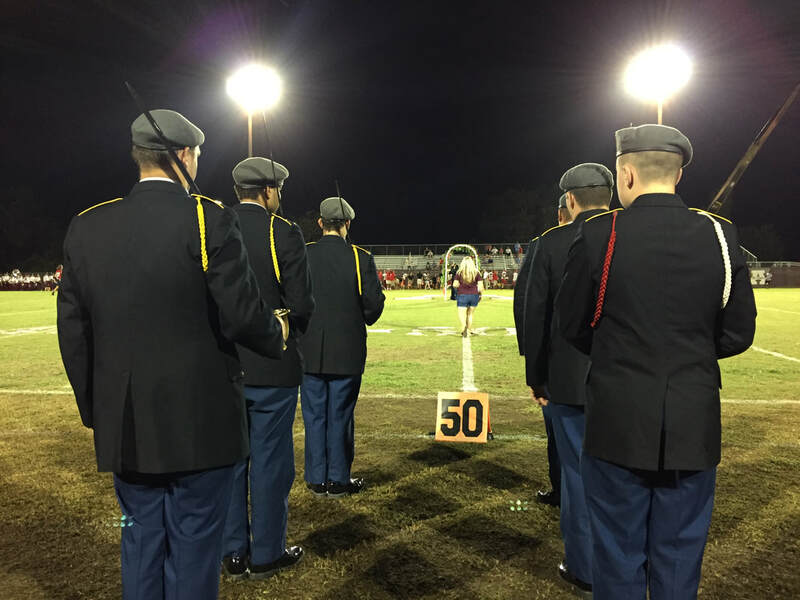 ​On November 17th, 2018, The War Eagle Battalion Raider team had their last meet at our school. The Raiders came to school at 5 A.M. to set up for the day along with cadets that volunteered to come and work shifts from 6am-11am or 11am-2pm. The scheduled events for all Raider teams was: 5K, Rope Bridge, Tire Flip, CCR (Cross Country Rescue) and a Raider Fitness Challenge. At the end of the day, Our Mix 1 team placed 2nd in the Mixed Rope Bridge and our Male 1 team placed: 3rd in 5k, 2nd in Tire Flip, 3rd in Raider Fitness Challenge, 2nd in Rope Bridge, 3rd in CCR, and 3rd place overall male team. 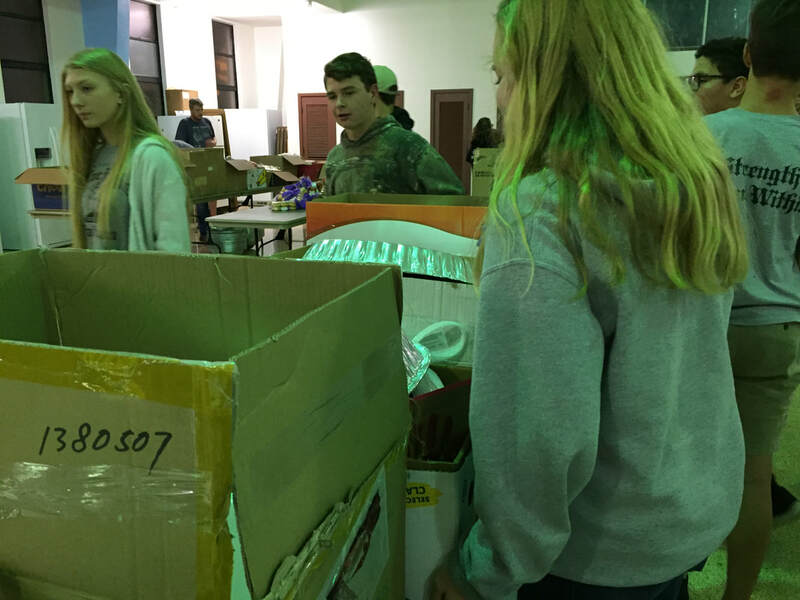 ​On November 16th, 2018, Cadets in the War Eagle Battalion went to St. Teresa’s church and worked together to pack up Thanksgiving dinners to families in need. The cadets arrived before 6 P.M. and put food into baskets then had dinner. When families began to come, cadets helped haul the baskets of food into their cars, and then stayed to help clean up. 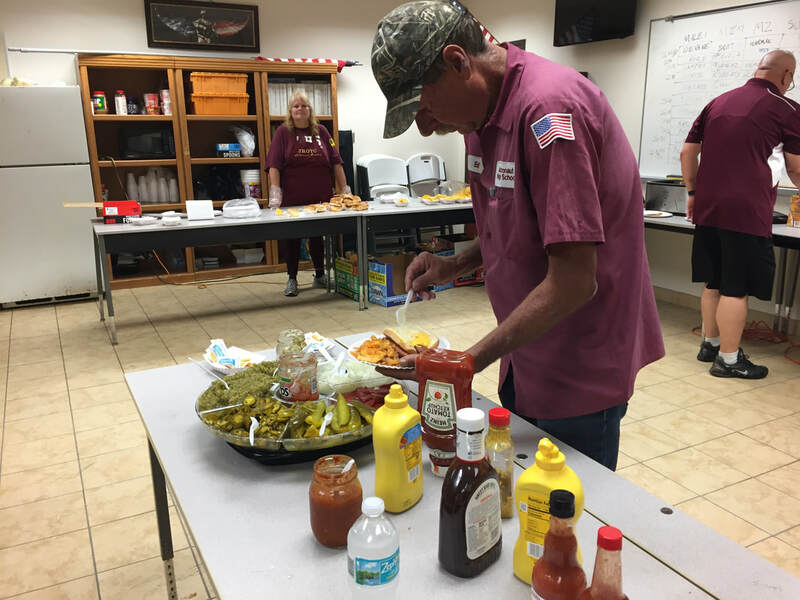 ​On November 9th, 2018, Booster parents in the War Eagle Battalion made hot dogs and nachos for cadets in the program. Cadets in each company brought in snacks or drinks and ate lunch during Astro-Hour along with teachers and staff members. On November 9th, 2018, the War Eagle Battalion Color Guard went to Pinewood Elementary School to honor the 50th anniversary for flag-day. The Color Guard arrived before 8:00 A.M. and honored the flag then came back to school during second block. On October 26th, 2018, students enlisting/in the process of enlistment into the armed forces stood on the field to take an oath. Before the oath, the Battalion received a check for the Raider team by Dona Weavel, President of Good Deeds Foundation, and Military Officer Association of America Cape Canaveral Chapter. Afterwards, SSG Farley read the oath and the enlisting people recited it back to him and the crowd and in the process, cadets in the War Eagle Battalion held the fifty state flags behind the Color Guard. The people who took an oath are (In order): Austin Scarborough, Dillon DeVane, Garrett Howell, Joshua Lugo, Kent Paul, Khalleal Sampson, Michael Mabry, Nathanial Carter, Quinten Davis, Seth Strite, and William Bailey. This past October 12th 2018, The War Eagle Battalion Color Guard kicked off the football game. 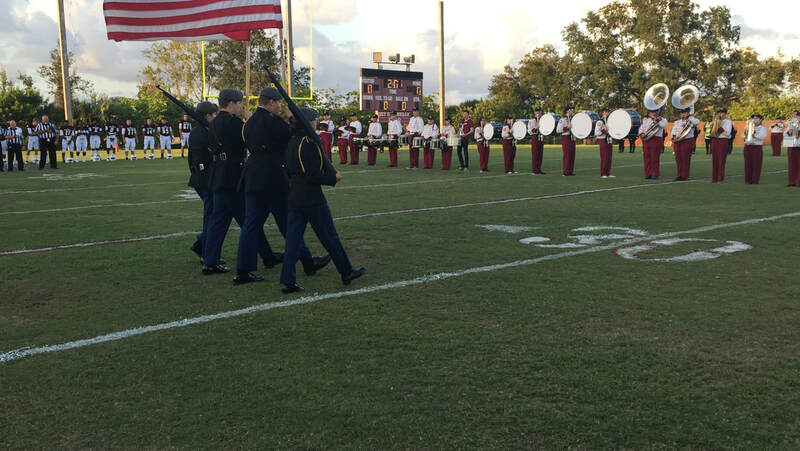 Lead by Cadet 2 L Brenna Pridgen, the color guard presented the colors during the opening game between our War eagles and the Lake Island Prep. ​On November 15th, 2018, Teachers gathered in the wrestling room during different periods and competed with each other by shooting targets to win either: 20lb Butterball Turkey, 13lb Butterball Turkey, Thanksgiving Duck, Southern Baking Hen, or Cornish Hen. The teachers that tied had an arm wrestle to settle who the final winner would be and Mr. Sexon beat Mr. Schindler and Mrs. Feaster beat Mrs. Stahc. ​On October 13th, 2018, Cadets in the JROTC Raider team came to school at 5 A.M. to help pack up equipment needed for their meet at Viera High School. When the cadets arrived, they helped set up and met with other Raider teams inside the school’s cafeteria. Cadets were briefed on the events planned for the day and took a CCR (Cross Country Rescue) test afterwards. 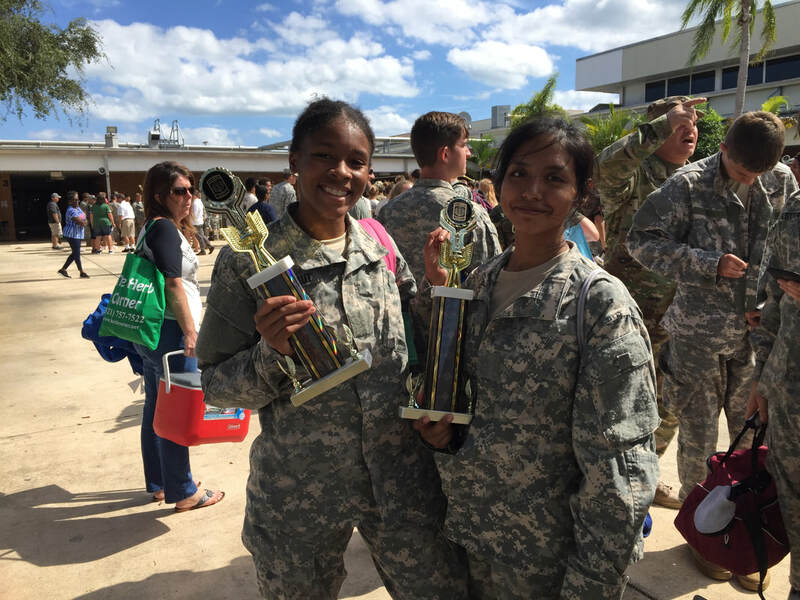 Cadets participated in events such as: 5k run, Rope Bridge, Tire-Flip, Kettlebells, and CCR. After all the events the cadets had an award ceremony and our Male 1 team placed 3rd in the 5k run. ​On September 27th, 2018, Cadets in the War Eagle Battalion took a field trip to the Brevard Veteran Center in Merritt Island. Cadets on Raiders came to school at 7 A.M. to help load supplies and cadets left school at 8:30 A.M. Cadets participated in events such as: Fishing in freshwater and brackish water, Kayaking, Paddle Boarding, Tug-Of-War, Chicago Ball, and a scavenger hunt in and out of the museum. Cadets came back to school at 3:00 P.M. and helped unload equipment and stayed in the JROTC room for the remainder of the day. 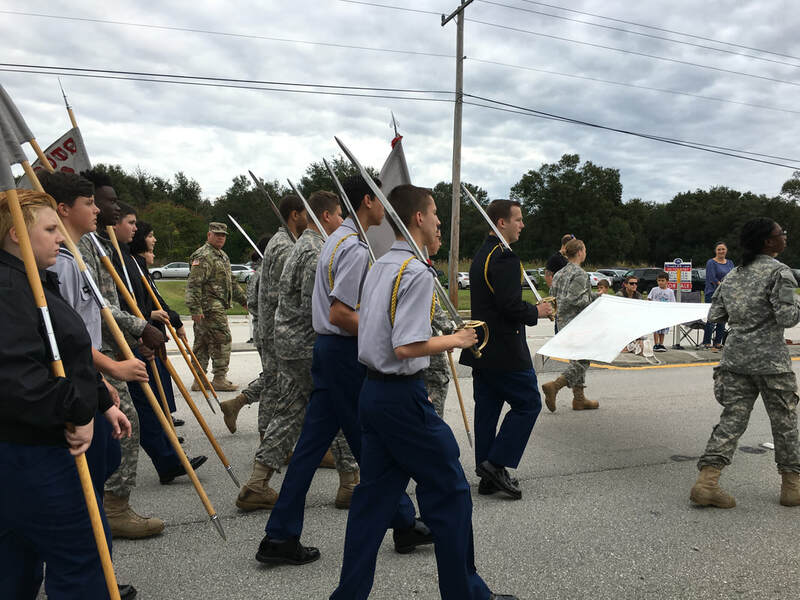 On September 21st, 2018, The War Eagle Battalion led the homecoming parade for the third year in a row. Cadets met at Bennett Auto Supply at 5 P.M. to rehearse and prepare for the parade. At 6 P.M. our Color Guard stepped off followed by cadets holding banners representing our battalion and school. Some Cadets passed out candy and others called out our cadences. After the parade, buses took cadets back to school where they helped put equipment away. 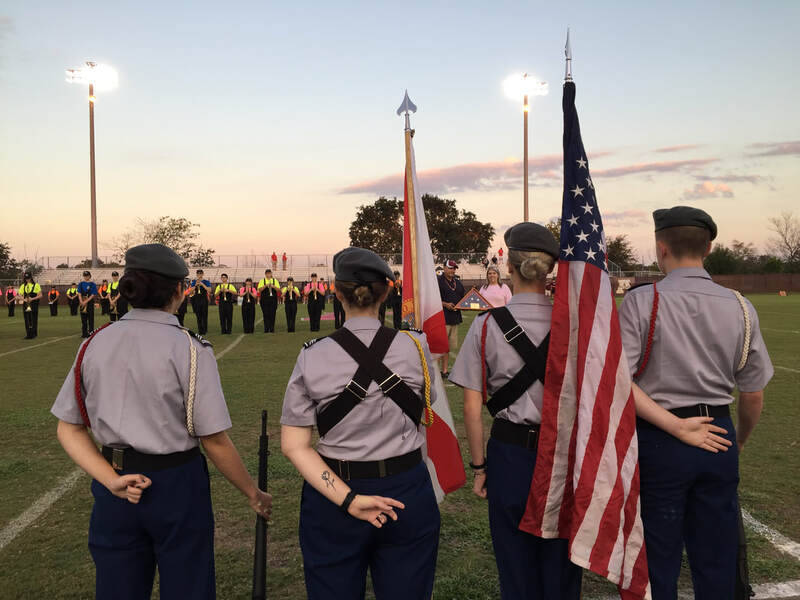 On September 21st, 2018, Members of the Color Guard held up sabers for the homecoming court during half-time of the football game. Cadets kept the sabers on the shoulders and raised them when a nominee walked under them. After each nominee lined up the Color Guard went back to the JROTC room to pack up and go home. On September 11th, 2018, Cadets: Brenna Pridgen, Dillon DeVane, Michael Mabry, and Ethan Harman briefed families on what their children will be learning and doing in the program this year. Families got to learn about the different teams and events the battalion participate in and what skills their children will learn. On September 8th, 2018, Cadets participated in helping students from different schools stay hydrated and cool down after a 3.1 mile run. Cadets showed up at 6 A.M. to set tables up with cups filled with water and helped set up a tent with fans for the runners. After the runners crossed the finish line, cadets gave them water and helped walk them to shade. ​​On August 30, 2017, some of our War Eagle cadets helped out with open house. Cadets Lugo, Nixon, Palfrey, Mabry, and Heller attended this event. It was an information session that highlighted what our battalion really is. Topics included: Drill Team, Rifle Team, Raiders, and color Guard. The presentation also explained how we run the program as cadets and what to expect throughout the year. It was a good chance for parents to meet with Colonel Whalen, SFC Negron, and the battalion’s student leadership. On May 25th, 2018, some of our War Eagle cadets participated in our annual JCLC summer camp. The cadets were split into companies where they worked as a team to compete against other companies. Cadets participated in events such as: Zip lining, Archery, Rope Bridge, Learning how to use their ACU pants as floatation devices, and Kickball. On September 19th, 2017 Astronauts JROTC helped clean up around the school due to hurricane Irma. The cadets worked together to pick up many of the branches that fell. This was the first part of our current Service Learning project to clean up the community starting at the very place our JROTC unit is. All companies participated in the effort and the schools yards are cleaner than ever. On September 29th, 2017, Astronauts JROTC cadets set out to Oak Ridge, a local cemetery in the Titusville area. A large portion of the battalion came to help clean up the property and also the neighboring area. This was the second phase of our War Eagle Battalion service learning project to help the community after the recent storm, Hurricane Irma. It was successful and our efforts to clean the perimeter were well met. The owner was grateful for the help and fed the cadets for their hard work. ​​ On October 12th and 13th, 2017, as well January 30th, 2018, the Astronaut JROTC participated in a physical endurance test that is part of our Continuous Improvement Plan of the year. The cadets participated in events ranging from push-ups, shuttle-runs, and a one-mile run on our school track with times being recorded in set parameters so our cadets did not overwork themselves. Cadets worked hard to succeed in these challenges and had fun competing with each other, bonding and raising moral of the Battalion. ​​ On October 19th, 2017, the Astronaut JROTC came together with the community to ​Astronaut High Schools homecoming dance that was followed up that weekend, October 22. The cadets met up at Benet’s Advanced Auto Parts and marched to Dixie Crossroads. The cadets wore their class b’s and presented the 50 state flags throughout Titusville. The color guard for this mission were Roberge, Harman, Olszyk, and Davis. 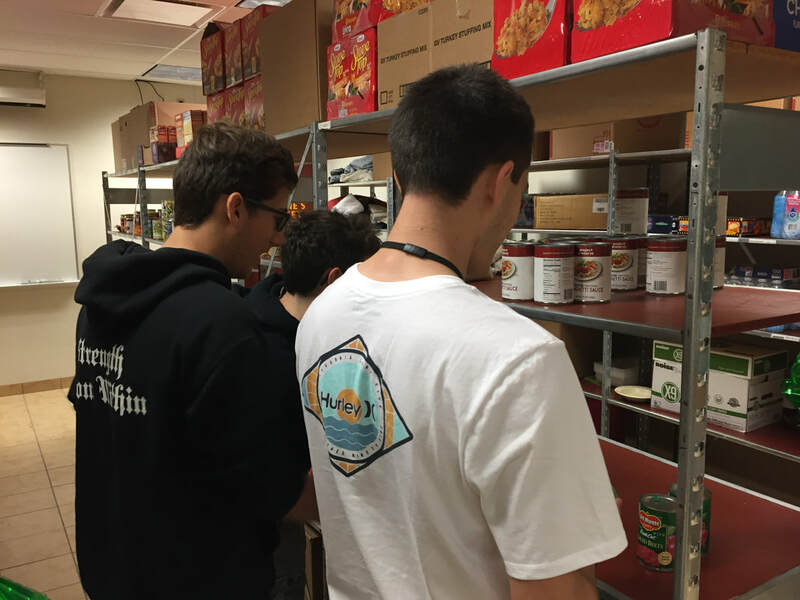 ​On November 18th, 2017, the War Eagle Battalion conducted the third portion of our service learning initiative. The community reached out and asked if we could clean up the LaGrange Cemetery. This old gravesite is home to many historical figures who are a key part to the history and making of Titusville. Cadets worked hard to ensure that all the graves were cleaned and the area was presentable. The people who run the church there thanked us for our hard work and dedication to the community. 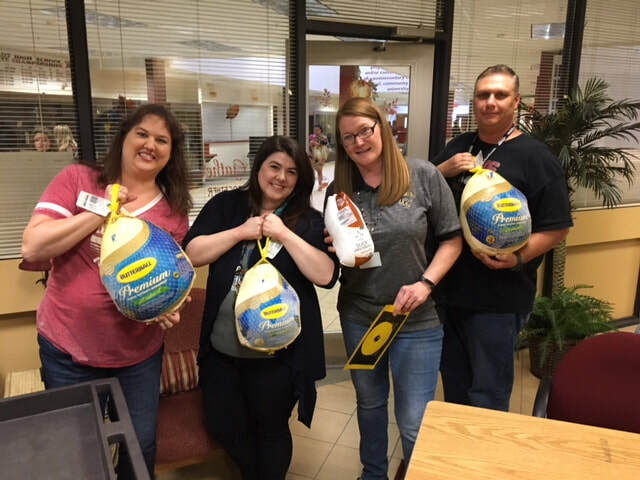 On November 19, 2017, the 8th annual Turkey Basket Brigade took place at Satellite High School. Cadets from our program drove to help the community provide Thanksgiving dinner for families in need. 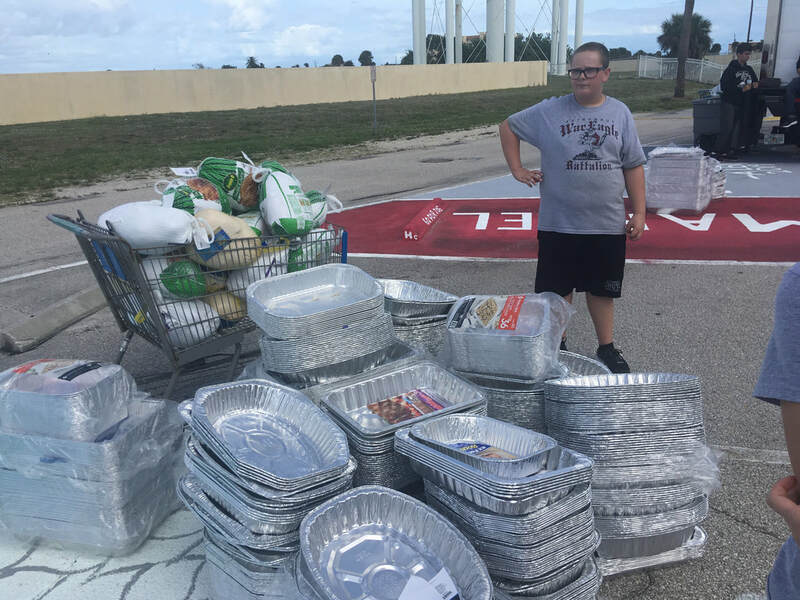 After hours of work, a total of 2,500 baskets were made and distributed throughout Brevard County. The Founder was very thankful for our contribution and service that she graciously donated more than 60 baskets to our programs cadets. The event ran well and the cadets had fun helping the community. ​​On November 3, 2017, a few of our senior cadets stood before Astronaut High School parents, teachers, and students to take their oath into the branch of their choosing. All of them have taken the steps or are in the process of enlistment in the US military. 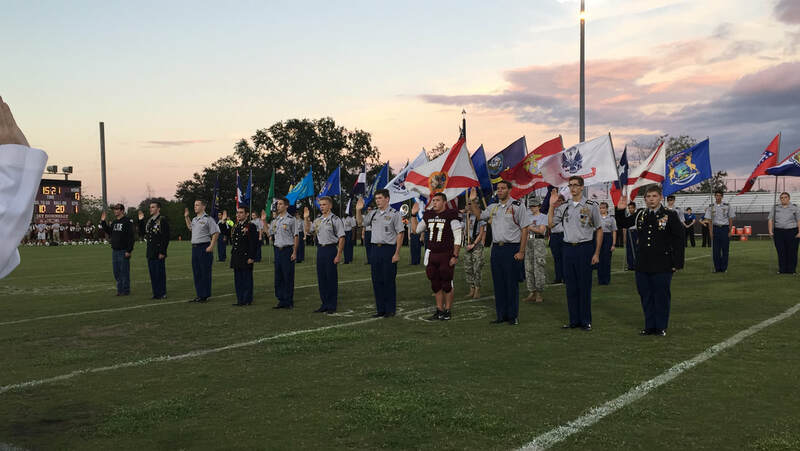 During half-time all the state flags were led out by the programs younger cadets to honor their peers. The crowd went wild when they finished and the game continued shortly after. ​On November 25th, 2017 volunteering staff members proceeded to River Park in Cocoa Village at 1500 to set up for the Space Coast Marathon the following morning. This involved unloading pallets of pancake mix, eggs, ice bags, as well as several large portable grills. The cadets helped arrange everything for the cooking as well as procedures for the following mornings volunteering cadets so that the operation could be executed as smoothly as possible. They concluded the setup at 1700. ​On Saturday December 2nd, 2017 the Astronaut High School War Eagle Battalion led the Mims Christmas Parade for the 16th consecutive year, beginning in 2001. There was approximately 80 cadets that participated in event. Before they marched, all of the cadets formed up in a battalion mass formation and had their pictures taken by C/CPT Mabry. We marched from Mims Elementary to AJ’s gas station on US1. Our cadets passed out pieces of gum to children while marching along this route. We do this parade annually and are a highly respected part of it. Great job to all cadets who participated in this event! ​On Friday, January 12th, 2018, Astronaut High Schools JROTC Battalion headed to Fort Christmas to learn the history of the location, learn and implicate exercise, and have fun. Cadets marched out and loaded onto the busses at 0845, arriving at Fort Christmas by 0915. Cadets were then released to investigate the fort’s historical sites, informational locations, and museums in groups no smaller than two. By 1015 scheduled company verses company activities began, starting with Chicago Ball. Lunch was had as a battalion at 1200. The battalion then did a police call on the Fort Christmas grounds, taking care of trash and other debris. Cadets arrived back at Astronaut High School by 1445. ​On January 23rd, 2018 Astronaut High School War Eagle Battalion got recognized by superintendent Blackburn for all the hard work the cadets have put into the program. The cadets have done many volunteer projects to help those affected by Hurricane Irma. In the battalions’ service learning project the cadets cleaned up debris from their school, the beach, and three different non-profit cemeteries. Many of these places would not have the time or people to help clean up debris from the hurricane due to the places being ran by volunteers; most of them being elderly. ​​On Monday the 20th of November, 2017, the cadets of the War Eagle Battalion held a food day. The leadership team decided to extend the offer of hospitality to the facility and staff of Astronaut High School, inviting their teachers for free lunch as a nice thank you for what they do. Cadets brought in chips, drinks, and desserts. SAI Lieutenant Colonel Whalen cooked hotdogs to serve alongside nachos. Volunteering parents served the food until the end of the day. Days such as this are available due to the hard work the cadets put in in previous operations. ​On Tuesday the 21st of November, 2017, the war eagle battalion hosted a marksmanship event to build relations with the facility of Astronaut High School. This event is held within the wrestling room on school property. SAI Lieutenant Colonel Whalen ran and overseen this event to ensure the safety of everyone involved. Volunteering cadets spot for those who are shooting. Not only does this event build good relations with the teachers of the cadets, but it also increases active knowledge on the handling of firearms and functions as a strong but fun safety class for not only the cadets involved, but also the facility. The teachers are awarded trophies as prizes for amusing achievements. ​On November 26th, 2017 the War Eagle Battalion’s volunteering cadets proceeded to River Park in Cocoa Village to make breakfast for the Space Coast Marathon runners. The shifts for this operation were as follows: 0600 to 1300 and 0800 to 1500. 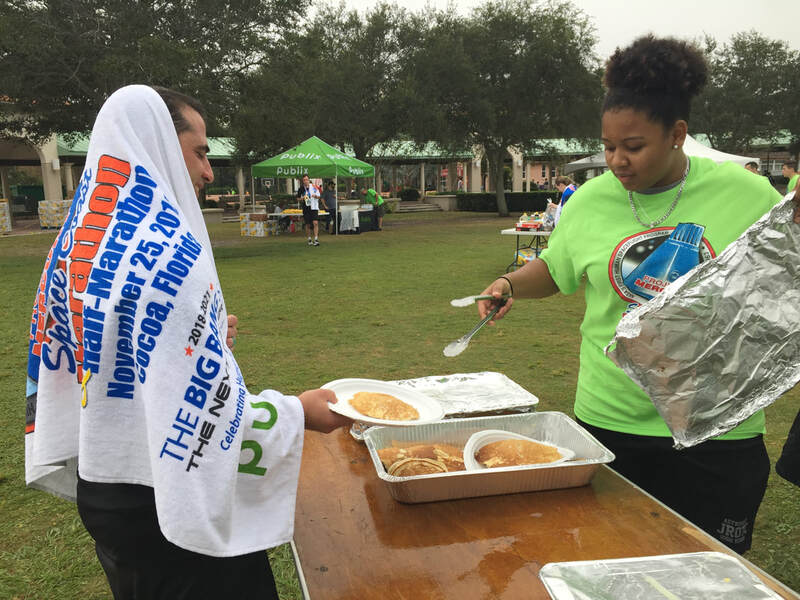 Participating cadets completed an array of tasks such as cooking eggs, pancakes, and bacon and serving those to a few of the five thousand marathon participants. The cadets also worked alongside fellow Brevard JROTC battalions. 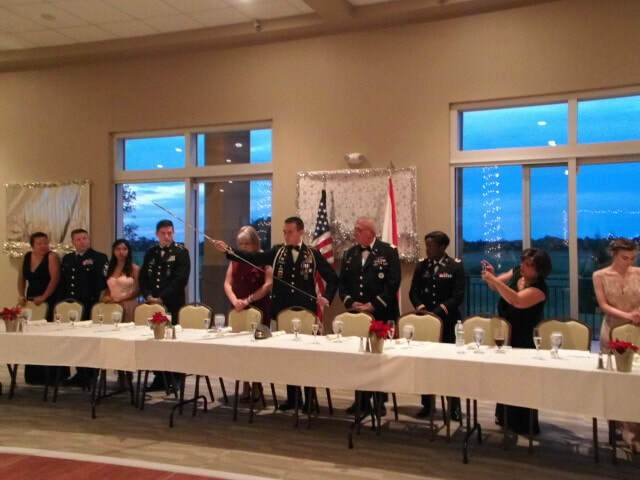 ​On December 16, 2017, the Astronaut High School War Eagle Battalion assembled for their seventeenth annual JROTC Military Ball at the Indian River Preserve. Over 90 cadets and their dates showed up for a formal dinner and dance. Before entering the ball room, cadets and their dates walked through an arch of sabers. After everyone was all settled in, we did our introduction, toast, and heard from our guest speaker, Hunter Rader. During the ball the cadets were served a wonderful dinner then danced the night away. 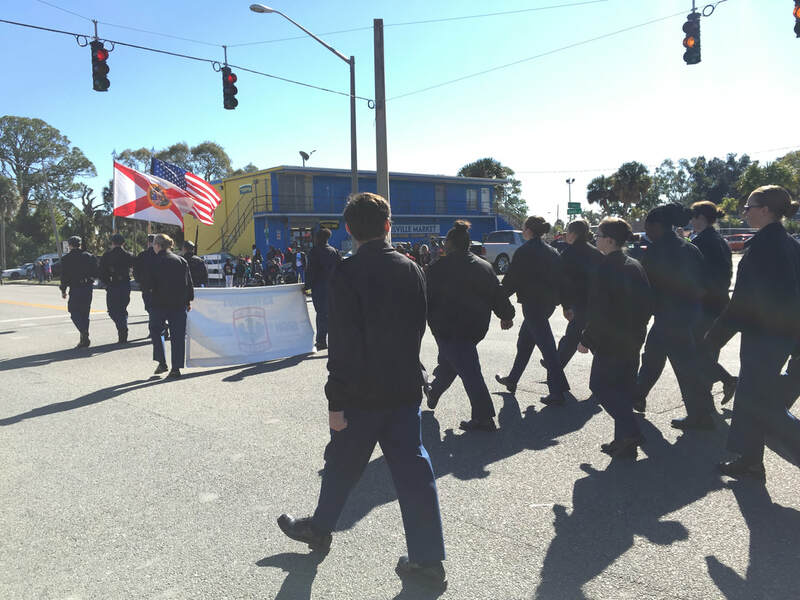 ​On Monday January 15th, 2018, the War Eagle Battalion of Astronaut High School led the annual Martin Luther King Jr. parade down South Street, beginning at the Adult Education and Senior Center. The cadet color guard led the parade, followed by the battalion banner. The Leadership team proceeded, leading the battalion formation. Cadences were called by C/CSM DeVane, C/Cpt Rember, and C/Cpt Roberge. The parade ended Saint James Church with the cadets being debriefed in battalion formation, helping put away the equipment, and being released at 1100. On January 29th, 2018 cadets LTC Nixon, MJR Whitworth, CSM DeVane, Mabry, Lugo, Ouzts, Roberge, and Strite went to Madison Middle School during the lunch hour to recruit future cadets. Our cadets wore four different types of uniforms while presenting to incoming freshman students about different teams they could join and more about Astronaut High Schools JROTC Program. Cadets LTC Nixon and MJR Whitworth presented in class ‘A’ uniforms, showcasing the leadership positions available that these future freshmen could obtain. Cadets CSM DeVane and Mabry showcased the ACU uniform for the rifle and raider team. Cadets Lugo and Ouzts wore class ‘B’s to represent JLAB and Drill team while cadets Roberge and Strite showed the everyday and general uniforms of cadets. On Friday, March 2nd, the cadets of the War Eagle Battalion held a meatball sandwich day. Cadets brought in chips, drinks, and desserts. Volunteering parents served the food until the end of the day. Days such as this are available due to the hard work the cadets put in in previous operations. 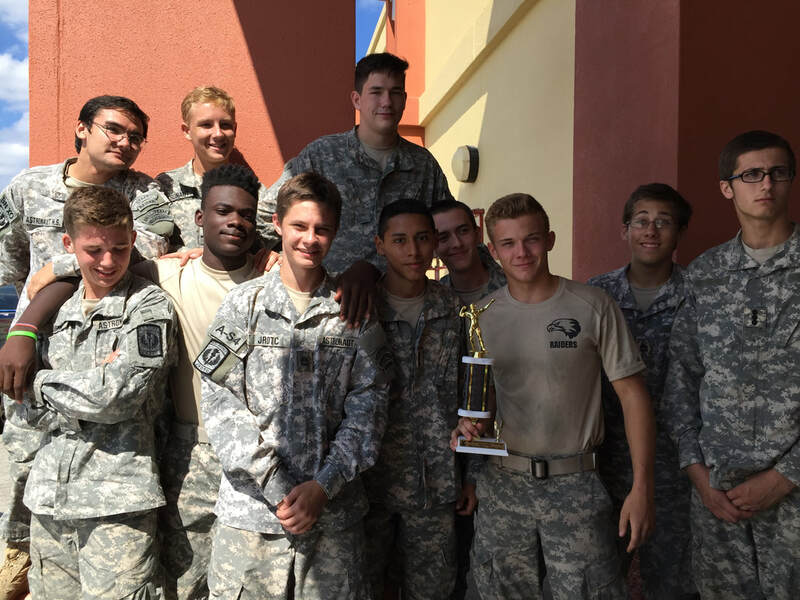 ​On January 27th, 2018, cadets from the War Eagle Battalion came together to help clean up debris from hurricane Irma. The cadets met up at Eddie Creek, in between piers 6 and 7 at 0900 with Park Ranger Jeff. Park Ranger Jeff briefed and informed the cadets on the history surrounding Eddie Creek and Playalinda beach. During the clean up the cadets picked up sticks, cans, wrappers and bottles while enjoying the ocean breeze. 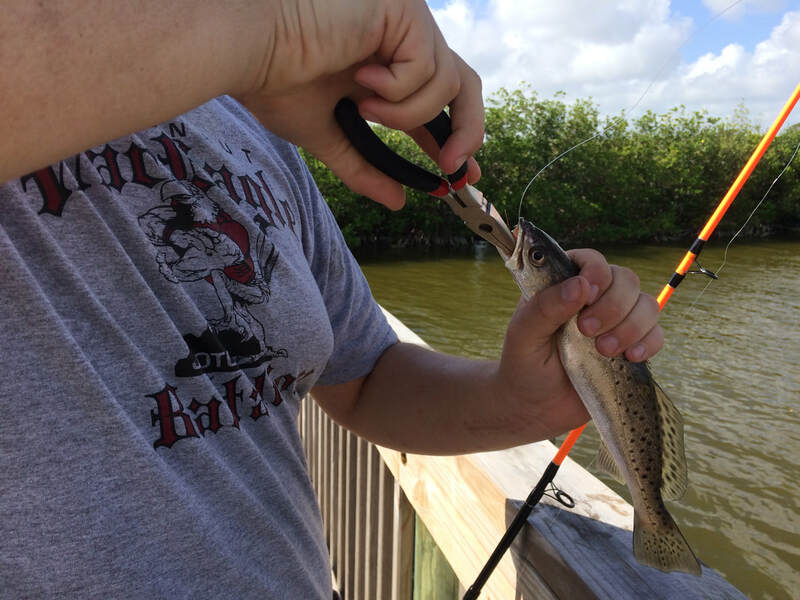 Not only did the cadets help clean up from after hurricane Irma but they also aided the environment by preventing seafaring animals from getting ill due to trash and debris. The cleanup concluded by 1100 and cadets were debriefed before being released.